Opinions & Views With Meaning! Thank You Readers! Thank You World! I want to first say thank you to everyone who shared a link or tweeted my blog or re-blogged my post and most importantly, everyone who downloaded my books on Amazon! I cannot be thankful enough for that! This weekend has been the best for me since the time I published my books! I had made a promise the first day of the giveaways to let you all know how everything transpired and now I wanna honor the same! Here is the breakdown: On the first day, hundreds and hundreds of readers downloaded my books. What surprised me was this observation: readers in the UK, Germany and Spain downloaded more copies of my second book [Across The River] than my first book [My Life Sentences – A True Story]. That was turned upside down on the last day! In North America however, more and I mean more than a thousand readers downloaded my first book [My Life Sentences – A True Story] more than my second book [Across The River]. Personally, I have no conclusion as to why that happened but one thing is for sure; the outcome was epic! Sometimes I look through pages of my books and cannot believe my eyes what I see! I normally ask myself, how on earth did I even write that? Of course the answer is, well, a smile and a feeling of happiness inside. The fact is this: those books would mean nothing without those who go to Amazon and download them and most importantly, read from chapter to chapter! Thank you so much! Last but not least, I reached another milestone which might be tempting to ignore but equally important! 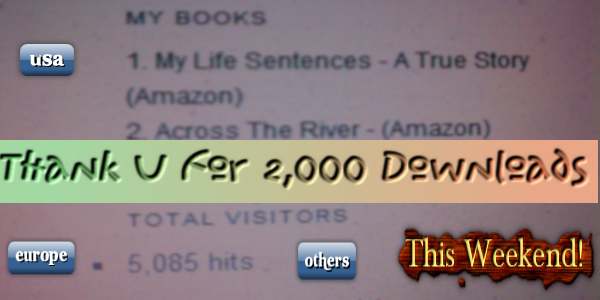 The total visitors to my blog reached 4,000 and within two days, it is now over 5,000! That is humbling! Sometimes I run out of stuff to post but when I think about my eager readers, I just get off the couch and do something..right? That is the spirit! (I started this blog a little over two months ago). Why did I choose to write books anyway? It all started when I was in high school……NO! I will not extend this longer than it is already, I care about your time! See you next time! Thank you and stay in the path of your dreams, so that when time comes, you will be ready to catch the vision! Please remember to subscribe to my blog on the right of this page(Home)! If you have questions on writing and publishing books, don’t hesitate to ask me through the comments section. I will respond to them with your value in my mind! Adieus! Peace!! You can still download my books My Life Sentences – A True Story and Across The River ! Cheers! First, I want to say that I have been waiting for this day for quite some time now. Yes, today(Friday) is the second of my 3 Day book giveaway on Amazon Kindle Store (My Life Sentences – A True Story). It makes me feel so happy, let alone accomplished, to say that everyone who is interested in reading a true story can do just that for FREE. I have had several instances where readers wish they had a way of reading my book if they do not own a Kindle. If you do not have a Kindle tablet or a Kindle app, you can definitely read my book without spending a dime on apps or tablets. Just do this: Go to Amazon Reading Apps and download the free cloud reader app and after that, download my book and read it from there! That is all you need.Good luck! Now friends, let us join hands and look at my dream goal! The last time I gave away my book on Amazon, I had more than a thousand downloads by readers from all over the world in a single day. The reason I wrote my book was to inspire others, give people a different view on life and that was what I wanted. I honestly didn’t consider being number one anywhere, after all, how often does that happen? Hold on, nothing is impossible in this world. I want to achieve my dreams, not necessarily showing up on the NY Times Book List but on Amazon! We can all do this together! Here is how: if you do not have a Kindle tablet or app, download it to your computer. Pass this link on, share with your friends through the social networks, it will mean the world to me, it will be everything I ever wanted. Help me reach that milestone and I will always be thankful! Why am I doing all these? Simple, nothing other than trying to inspire others and one way or another, make this world a better place! I will be posting the total numbers on Sunday and I hope you will back to celebrate with me! I can’t wait. MY LIFE SENTENCES – A TRUE STORY . You can also simply click the image above and you will be there in no time! See you soon and THANK YOU SO MUCH!!! Stay inspired, always! Quora – The partner that never disappoints!